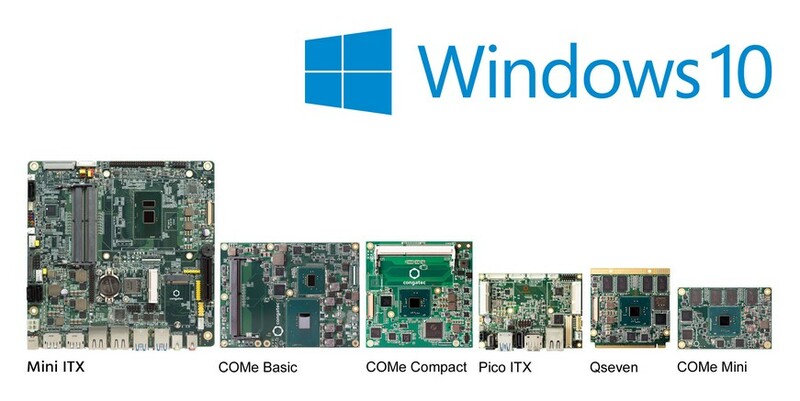 San Diego, CA, January 31, 2017 * * * congatec – a leading technology company for embedded computer modules, single board computers and embedded design and manufacturing services – has announced its comprehensive support of the IoT editions of Windows 10. These full versions of Windows 10 are characterized by their extended security functions and lockdown options for IoT-connected appliances. congatec has integrated these innovative features on all its current boards with Intel® Atom™, Celeron®, Pentium®, Core™ and Xeon® processors as well as AMD Embedded R and G Series processors. Customers benefit from an overall simplified development of IoT connected devices. Target markets include industrial automation and production, retail and outdoor advertising, the healthcare and transportation segments, plus a host of additional industries. congatec, Inc., with its headquarters in San Diego, California, is a leading supplier of industrial computer modules using the standard form factors COM Express, Qseven and SMARC as well as single board computers and EDM services. congatec’s products can be used in a variety of industries and applications, such as industrial automation, medical, entertainment, transportation, telecommunication, test & measurement and point-of-sale. Core knowledge and technical know-how includes unique extended BIOS features as well as comprehensive driver and board support packages. Following the design-in phase, customers are given support via extensive product lifecycle management. The company’s products are manufactured by specialist service providers in accordance with modern quality standards. congatec, Inc. is a subsidiary of the German based company congatec AG, which has additional entities in Taiwan, China, Japan and Australia as well as in the United Kingdom, France and the Czech Republic. More information is available on our website at www.congatec.com or via Facebook, Twitter and YouTube. Intel and Intel Atom, Celeron, Pentium, Core and Xeon are registered trademarks of Intel Corporation in the U.S. and other countries.